As a young man, Bob Ney taught English in Iran, and after returning he was elected to Ohio's state House in 1980. He jumped to the state Senate in 1984, where he stayed for ten years before running for the US House in 1994. A key aide in Ney's office from this time was found guilty of bribery and jailed in 1998. During Ney's long stint in the US Congress, his votes lined up with the Chamber of Commerce -- read, big business -- position on the issues 88% of the time. 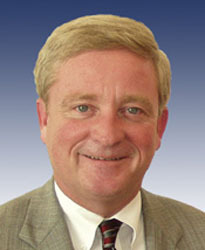 He was one of only three Republicans who voted against the USA PATRIOT Act of 2001. Among the few legislative initiatives Ney brought to the floor, the most prominent was the Help America Vote Act, which encouraged the rapid adoption of electronic voting machines. He was also the co-sponsor, with Rep Walter B. Jones (R-North Carolina), of legislation which re-named french fries and french toast "freedom fries" and "freedom toast" in the House cafeteria, after the French government refused to participate in the 2003 invasion of Iraq. Since 2005, scandals have swirled around Ney's name. Lobbyist Jack Abramoff, convicted of conspiracy and fraud, admitted bribing Ney to introduce legislation favorable to Indian casino clients, to support Abramoff's attempts to buy a Florida gambling company, and to support another well-connected client's legislation allowing goods made at third-world wages in the Mariana Islands to carry "Made in the USA" labels. By 2006, Abramoff and two other lobbyists had pleaded guilty to federal charges and implicated Ney. Two members of Ney's staff had also been indicted, making his re-election increasingly unlikely. Ney had already won the Republican primary, but three months before the 2006 election he announced he was withdrawing from his re-election campaign to spend more time with his family. "My name will be cleared," he said, "and at the end of the day, I will be vindicated." On Sept. 15, 2006, Ney took a plea bargain offer. He admitted accepting bribes, and agreed to plead guilty to making false statements, conspiracy to commit fraud, and violating U.S. lobbying restrictions, in exchange for a prison term of just 30 months. He was released on 15 August 2008, after 17 months behind bars. A November 2010 article in National Journal reported that Ney is now "spending his days in Dharamsala [India], trying to master the Tibetan language and eagerly awaiting the return of the Dalai Lama and the chance to hear more of the exiled religious leader's teachings."